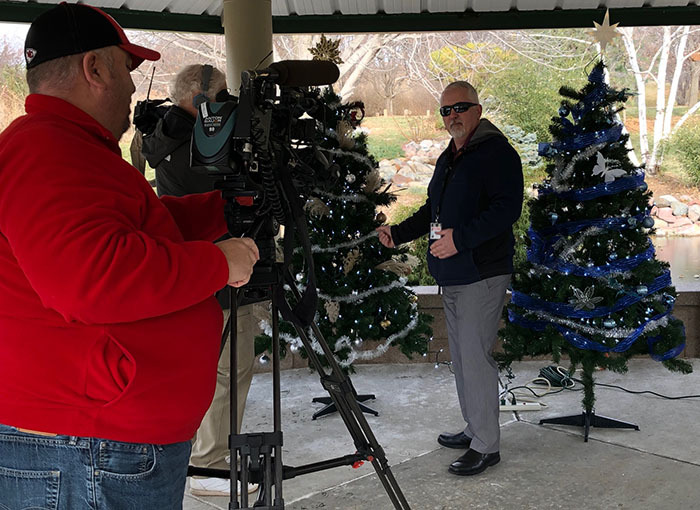 Arlo Christensen talking about holiday lighting safety during the media event at the OPPD Arboretum. It may be time to deck the halls, but you don’t have to break the bank – or a leg – in the process. Switching to energy-efficient LED holiday lights can save you money right away, without losing any of the sparkle of the season. And taking some simple safety precautions when lighting up your home’s exterior will ensure an injury-free holiday. 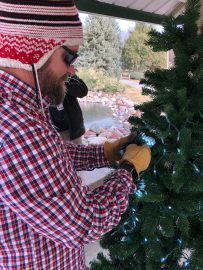 OPPD recently put that philosophy into practice by holding a Christmas tree decorating contest at the utility’s arboretum. The event, which was open to the media, also put the spotlight on safety around the holidays. Hundreds of people fall from ladders each year when trying to hang lights on the exterior of their home. 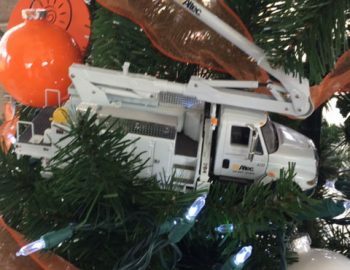 Here are some useful and simple safety tips to remember as you’re dragging out the ladder to channel your inner Clark Griswold. When hanging outdoor lights, stay far away from overhead power lines. Don’t use ladders or decorate trees near them either. Outdoor lights should have labels that clearly state they are certified for outdoor use. Only plug them into ground-fault interrupter (GFCI) protected recepticles. Only use lighting listed by an approved testing laboratory such as UL or ETL/ITSNA. 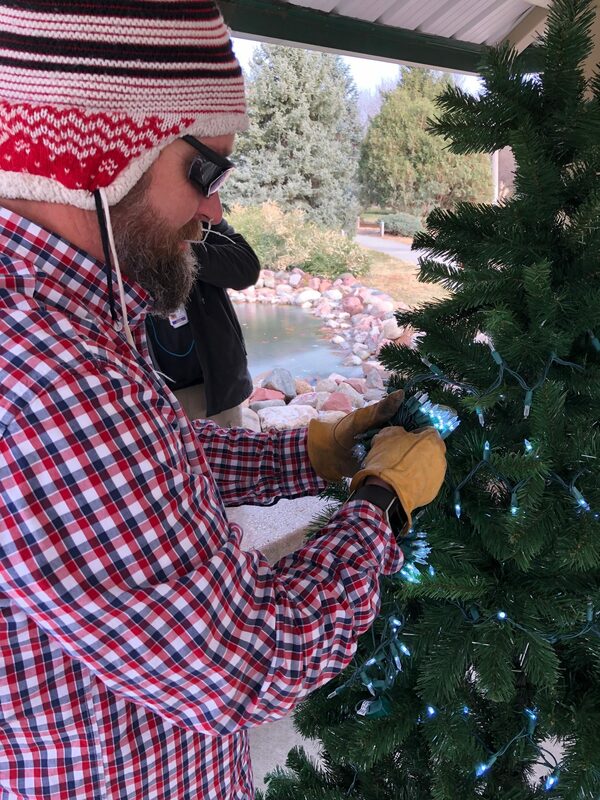 Before putting up your lights each year, take a few minutes to inspect them for frayed wires, bare spots or gaps in wire insulation, broken or cracked sockets and excessive kinking or wear. Only use newer lights with thicker wiring that requires safety fuses to prevent overheating. Avoid driving nails, staples or tacks through wiring insulation. Don’t link more than three light strands, unless the directions indicate it is safe. Connect strings of lights to an extension cord before plugging the cord into the outlet. Make sure to periodically check the wires by touch, to ensure they are not warm. Unplug your tree lights and outdoor lights before you go to sleep, or invest in a light timer. Don’t conceal cords under rugs, furniture or other appliances. If covered, cords can overheat or become frayed and cause a fire. Now that you have a safety refresher, let’s talk money – specifically how much you can save by switching to energy-efficient LED holiday lights. They’re safer. LEDs are much cooler in temperature than incandescent lights, reducing fire and burn risks. They’re sturdier. LEDs are made with epoxy lenses, not glass, and are more resistat to breakage. They last longer. LED lights typically last about 10 times longer than incandescent bulbs. They’re easier to install. Up to 25 strings of LEDs can be connected end-to-end without overloading a wall outlet.